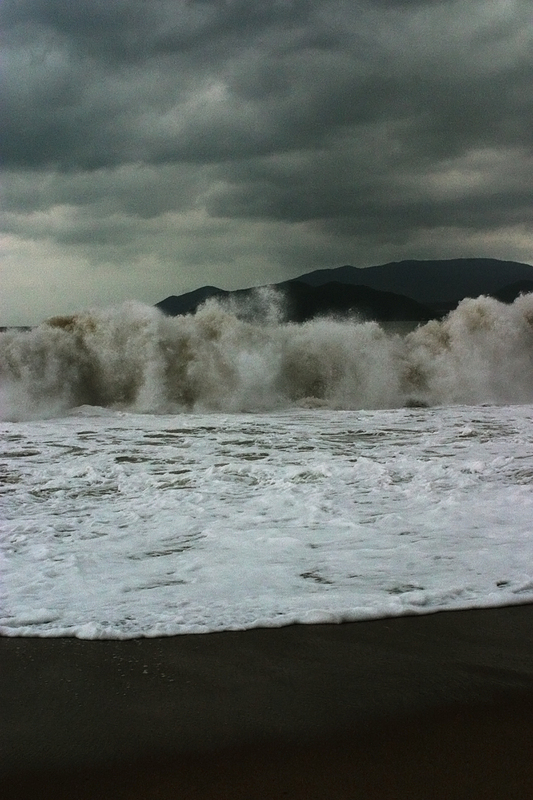 The wind, clouds and waves are not inviting us to take a bath, so we just go watch the explosive waves and eat. Yesterday in the street we noticed a 3D movie theater. I was checking a poster with titles and times when a girl wearing a slightly extravagant hairy white pullover offered me tickets for Gulliver’s Travels. Initially I wasn’t sure if she was really connected to the movie theater because I expected some kind of booth where tickets were sold. 40.000 VND including one drink. That’s about 1.35 EUR. The movie was starting in 4 minutes. The projection room was above a clothes shop. We went up some narrow stairs. We left our shoes next to a pile of shoes before the curtains. On the other side, 3 rows of foam sofas, maybe enough for 20 people. A girl gives us the 3D glasses and offers us drinks. A mouse pointer in the screen double clicks on a file. The movie starts. It would be nice if every neighborhood in the world had tiny cozy cinemas with tiny prices like this.